You are here: Home>Archive>Days of Pride Collection.>Collection of items relating to Arthur Lewis Lloyd.>Envelope addressed to Mrs W.H. Lloyd. 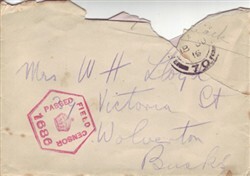 Envelope addressed to Mrs W.H. Lloyd. Envelope addressed to Mrs W.H. Lloyd. Stamped ‘FIELD POST OFFICE 70 A 18 JU 16’ and ‘PASSED FIELD CENSOR 1686’.